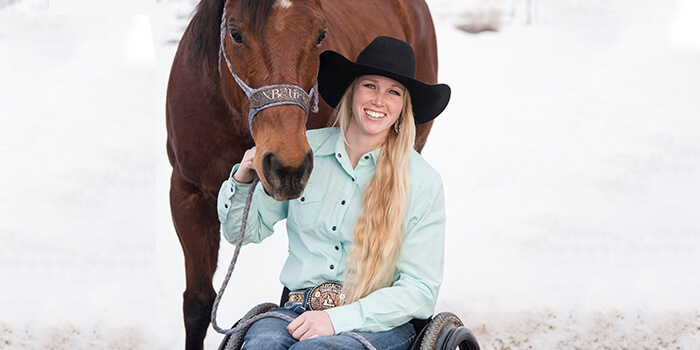 Amberley Snyder grew up in southern California with her five siblings. She began riding lessons at the age of three and her love and passion for horses began. After her fathers job change, the family moved to Utah. At seven years old Amberley would willingly adhere only if she was promised a barrel racing horse when they arrived. 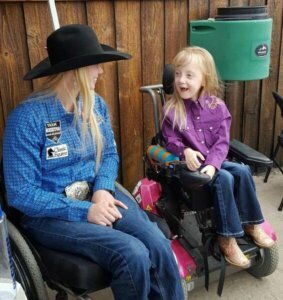 She got her request and thus began the rodeo career of Amberley Snyder. Unlike her siblings who enjoyed gymnastics and being on the baseball field, Amberley’s place to be was the arena. 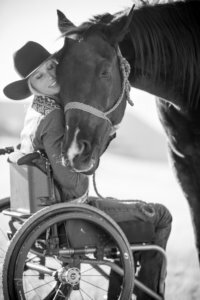 She qualified for the National High School Finals in the pole bending in 2009 and won the National Little Britches Rodeo Association All-Around Cowgirl World Championship. Amberley also was an active FFA member and was elected Utah FFA State President in 2010. January 10th, 2010 was a day Amberley’s life would change forever. Amberley was passing through Sinclair, WY on her way to the Denver Stock Show and Rodeo. She took a look down at her map and looked up after only a few seconds to find she had drifted into the other lane. Amberley then over corrected and lost control of her truck. She was then ejected from the vehicle and slammed into a fence post that broke her back and immediately she lost feeling in her legs. In result, Amberley is paralyzed from the waist down. But this was not to stop Amberley from doing what she loved to do, she was not going to give up. After only four months she was back in the saddle! Amberley began speaking and telling her inspirational story and inspiring others at elementary schools, colleges, national FFA conventions and everything in between. She also continues competing in rodeos across the United States. She was voted the fan exemption contestant at the world’s richest one day rodeo, RFD-TV’s The American. She competed with the best of the best and received a standing ovation from over 40,000 fans in AT&T Stadium that day. Amberley’s journey before and after her accident has been brought to life in WALK. RIDE. RODEO., a Netflix movie released March 8, 2019 and is a MUST WATCH. You will be inspired by her endless determination for getting back to doing what she loves and the belief that anything is possible. Plus she even does some of her own stunts! WesternWomen.com sat down with Amberley to ask her a couple of questions. Amberley: I am pretty simple. I think your style comes from your heart. I mean on the outside I am a jeans, hair in a braid and ball cap type. On the inside I think your style is about your smile and the kindness you show other people. How did you first get involved with the Western Lifestyle? Amberley: I started riding at 3 and competing in rodeos at 7! I would say I was involved from then! Amberley: Today doesn’t have to be your day, but tomorrow is going to be. Amberley: Speaking at National FFA convention, running in The American, and honestly any of the pro rodeos I’ve placed at! What is your favorite part about the Western Lifestyle? Amberley: I love how hard everyone works!! I feel the western industry is a place where you have to work for what you get. Amberley: My planner. I wouldnt even know what I was doing without it. Amberley: I do love netflix and if I need a day off you can find me binge watching something. My horses of course are my favorite past time whether its to unwind or not! !